“Barcelona, proud of its present, seems to have forgotten its origins, with risk of endangering its future. The metropolis of today, is inheriting the industrial world: without the factories, on which is constructed our modernity, not the economic raise, nor the modernism or the capacity to lay the foundations - in secrecy antifrancoist - of a society able to respond to the new challenges on a positive way. Recovering the democracy, the re-use of many manufacturing spaces can contributed decisively to the urban renovation. 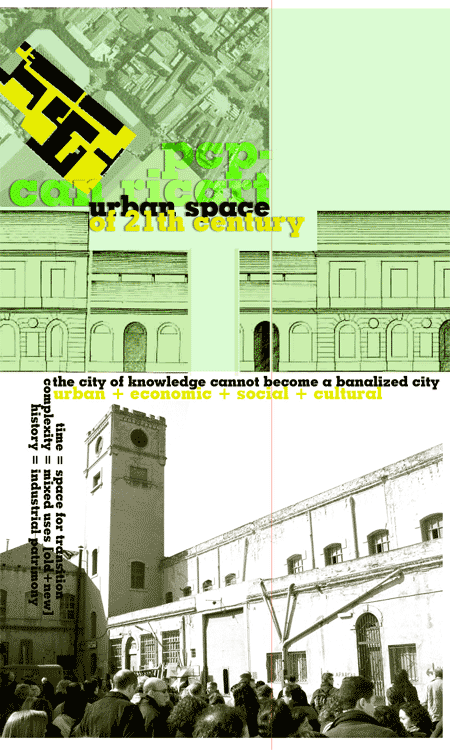 Nowadays, there is the risk of ending up with a 'tabula rasa' of the industrial landscapes of more interest than the city has left, in damage of their own renovation: the city of knowledge cannot become a banalized city. (...) If Ripoll would be the cradle of the millenarian-Catalunya, than Poblenou has been the cradle and the creation of contemporary Catalunya. “Because this new area of concentration as proposed, must also be new in his definition, the incorporating, mixture, activities of different ranks of attraction (local, municipal, metropolitan) and of different types (productive, commercial and services, cultural). We could say that we are speaking about a new center in Poblenou, of the century XXI, a new style of concentration that is made in time, diferent uses and history. Something that is impossible to create, and pretent with artificial comercial centers such as Glorias and Diagonal Mar (neighbors of Can Ricart). > pervasive and locative arts network. january 28, 2005. > parc central park. "an emerging urban kitchen." may-september, 2004. > creative cities: the rise of the creative class. "on the importance of place in the knowledge-driven economy." june 10, 2002. > sub-cultural urban districts: cities and culture. "overlapping of the geographies of production and consumption." may 29, 2002.